We are going to start with a guide to some of the best practice amps available today and hopefully answer any questions you may have. Feel free to skip straight to our list of recommended practice amplifiers, otherwise, please read on. Note: We've recently updated our list to include a highly acclaimed amplifier from Roland. If you have an electric guitar, you are going to need an amplifier. But what sort of amplifier? What brand? Marshall, Peavey, Vox, Fender, Messa Boogie? There are a multitude of options available to you, but the ideal amp for both professionals and beginners alike would be a low powered budget combo amp or 'practice amp'. 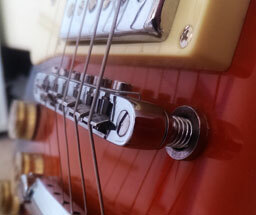 ... don't forget, the amplifier can be just as important as the guitar in determining the quality of sound produced. 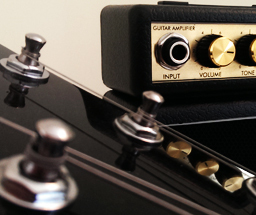 What exactly is a practice amp? A practice amp is basically a low powered compact and lightweight combination amplifier that is perfect for practicing with at home, or for use at small venues. They usually range in power from around 5 to 40 watts (can be higher) and come with a speaker of about 6 to 10 inches in size. Combination or 'combo' means that the amplifier and speakers are in the same cabinet. A combo amplifier less than 40w will generally be referred to as a practice amp. 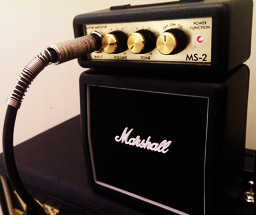 There are a wide range of different types of guitar amplifier that can be considered 'practice amps'. Battery amps can usually be powered by either batteries or ac adaptors. We can roughly split them into three distinct categories. These are smaller, low powered versions of some of the larger classics by the likes of Vox, fender, Marshal etc. They usually run off batteries or mains electricity and are lightweight and portable. The low power means they aren't suitable for gigging. Unlike the mini amplifier, headphone amps don't come with a built in speaker. This means you can only listen to the amplified sound with a pair of headphones. Obviously these aren't any good for playing live, but they are ideal for practicing your guitar without disturbing others. You can just clip one to your belt and practice where you like. All the amps above can be classed as portable but there are some bigger ones available that are a bit more powerful, come with more features and are ideal for buskers. You could say a small mains powered combo amp is portable but some people define portable as 'battery operated'. If you want to know more about battery amps, read our guide to buying the best battery powered guitar amp. If you're looking for an ultra-compact portable practice amp, our Roland Micro Cube GX review will be of great interest to you. There are an enormous number of mains powered combo amplifiers available today but, as we said earlier, to be considered a practice amp, it will generally be lower powered and not too big or bulky. One big consideration is whether the amp uses solid state technology or tubes. If you are buying a practice amp, you will probably end up going for solid state. If you are unsure of the difference, we'll clear it up later on in this article. In the meantime, let's take a closer look at some amps that are ideal for practicing your guitar. In the table below we compare 5 relatively inexpensive practice amps that offer good value for money without compromising on sound quality. They are all top quality, get great user reviews and are ideal for the bedroom guitarist, busker or playing small gigs down at your local pub. If you do decide to buy one today, don't forget that the amplifier can be just as important as the guitar in determining the quality of sound produced. If you are going to use the amp for playing live with a band then you will probably need at least 25w, depending on how loud your rhythm section is of course! If you are only going to use the practice amp at home, 15 watt should be ample whereas 100 watt with a 15 inch speaker would be overkill. Once again, what you are willing to pay for an amp comes down to your personal situation. There is not much point in spending more than �100 if you are only playing at home, no matter how experienced you are. On the other hand, if you are playing regular gigs with a band then it might be worth spending that bit extra. As you would imagine, the price of an amplifier can vary dramatically depending on the specification. Valve amps cost more than solid state amplifiers for example, which brings us nicely onto our next point. Basically a valve amp or tube amp uses valves (surprisingly enough) whereas solid state amplifiers use transistors. A valve amplifier or tube amplifier is a type of electronic amplifier that uses vacuum tubes to increase the amplitude or power of a signal. In terms of audio quality, a valve amp has a much nicer tone than a solid state equivalent (if it was good enough for the Beatles etc.) but a solid state amp can still sound great and most people won't even notice the difference. Most practice amps will be solid state as they are cheaper, portable and usually more reliable. Can cost more to look after i.e. replacement of valves etc. Was and still is used by some of the greatest bands of all time! 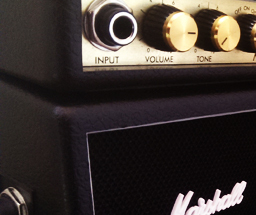 Some practice amps come with on board effects and features such as tone control, reverb and chorus. It is worth noting that valve amps only usually have limited effects available whereas solid state amplifiers can come with all sorts of digital effects such as amp modelling (using the built in effects to create numerous variations of sound). 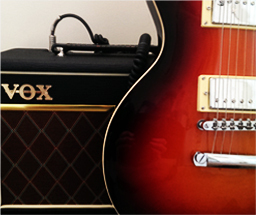 Whether or not you choose to purchase a practice amp with these additional attributes is entirely up to you. However, don't base your decision purely on the effects included, as you can always purchase external components (a Wah pedal for example) at a later date. Also, many effects can be overrated and if you're a beginner, playing without them can help you learn a more expressive style. Effects can also cover up mistakes and lead to a sloppy style of play, they can be fun though! Some makes of amplifier are synonymous with certain genres of music. Fender with country, Marshall with rock, Vox with classic British rock, Messa Boogie with hard rock, Peavey with heavy metal, and so on. That isn't to say that if you want to play heavy metal you must use a Peavey amp. You can use whatever make or model you like. 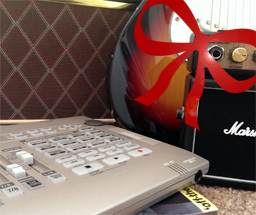 Anyway, most manufacturers make various models that are suited to different styles of music. For example, the 1957 fender Deluxe is a great blues amp. Obviously you might not want to play one particular genre of music, in which case you want an amp that is capable of producing a multitude of musical tones (this is where modelling comes in handy). If you only want to play heavy metal, go for an amp with a lot of gain and overdriven tones so you can crank out those blistering guitar solos. Help! I Can't Decide Which Is The Best Practice Amp To Buy! We've covered quite a bit in our brief overview and it is a lot to take in. Don't be daunted however and remember a few key points and rules of thumb. Is the amp you take equal to the sound you make? Well, it is certainly a key factor for any guitarist, so hopefully our guide has been of some use and you are now ready to buy your new practice amp with confidence. The amp you finally decide upon will depend on your individual circumstances as a guitar player and, of course, your budget. Just try and make sure you buy the best practice amp you can within your price range. If you are still struggling to make a decision, you won't go far wrong if you pick one of the practice amplifiers we have reviewed. If you can't narrow it down to just one, you can always buy two amps with different characteristics. Finally, good luck in finding your new practice amp and thanks for reading our guide here at 4guitar.co.uk - we appreciate the support. Remember, music is what feelings sound like. 09/05/17 - What is the best way to learn to play the guitar? Shall we find out? 03/03/17 - Here are 5 common reasons beginners feel like giving up learning guitar. Read through our list and find out how to prevent them happening to you. 20/02/17 - What's the best electric guitar for a beginner? Hopefully our list will give you a good idea and you'll soon be jamming away like a pro! 01/02/17 - If you're looking for a great portable practice amp, we've just added a review of one of the best battery powered amps going - the Roland Micro Cube GX.